For ghosts, ghouls and goblins alike, this is the weekend of the year. Thousands are expected to attend this year’s Freakfest on State Street. And though the event is still a few days away, a downtown clothing store is already seeing a boost. “Pretty much Thursday through Saturday we get a full house, full of people,” Ragstock employee William Hall said. As last minute shoppers look for that perfect costume, Ragstock has expanded its hours and brought in new help. “We actually switched the whole entire store around. We moved everything to one side of the store and have a whole section full of Halloween,” Hall said. While some businesses like Ragstock expect the rush to happen a few days before Freakfest itself, others are gearing up for a busy night during the event. “We take this night very serious, it’s probably one of our biggest sales nights of the year,” Zachary Chapman, marketing director for Ian’s Pizza Madison, said. Ian’s is bringing in extra gear and people to serve up slices by the thousands. “We have six decks now that will allow us to get more pizza out there faster,” Chapman said. 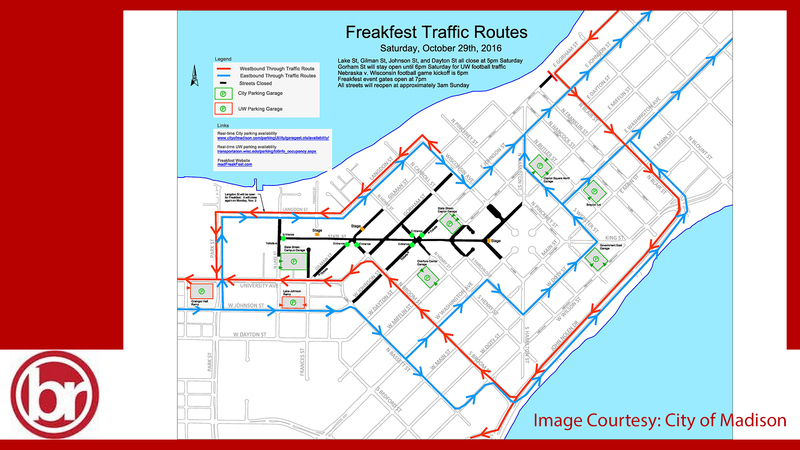 With so many people flocking to the downtown area for Freakfest and a Badger home football game, city officials are planning ahead to make sure the scariest part of the celebration isn’t the traffic. Several streets, including portions of Johnson, Gorham and Lake Streets will be closed starting Saturday evening until 3 a.m. Sunday. Metro bus routes near the Capitol Square will also be detoured Saturday. A full list of detours can be found on the city’s website.